Several years ago I took a workshop called “Arpeggio Meditations” taught by Daniel Ward. The concept was to play complementary, musical, and interesting chords over a repeating picking pattern. In this way you could get into “the zone” and practice some pretty serious fingerpicking without a lot of conscious thought. At the time I thought it was a pretty good idea. 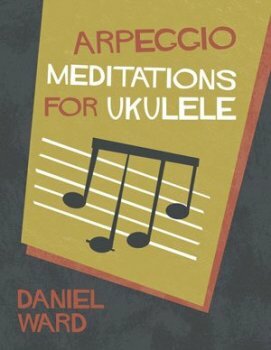 I think it’s an even better idea now that I’ve had a chance to look through Daniel’s new book on the same subject, Arpeggio Meditations For Ukulele, which retails for $19.99. Coming for a Spanish guitar background, Daniel Ward probably has one of the best fingerpicking hands in the ‘ukulele world. He plays effortlessly, with grace and flow that most contemporary shredders fail to achieve. 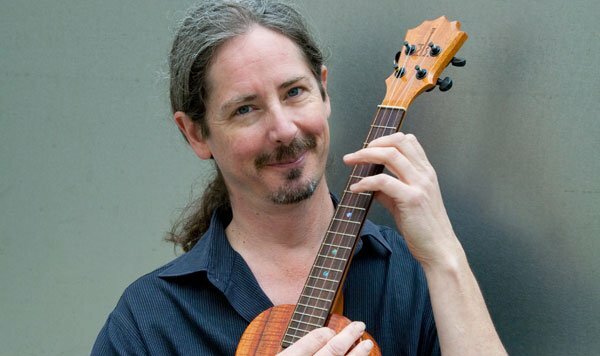 Naturally, Mr. Ward is the perfect person to instruct ‘ukulele students in the art of fingerpicking. Now he’s expanded his reach beyond in-person workshops so that players can put in the mind-numbing hours needed to master the right hand on their own time. Arpeggio Meditations For Ukulele is a lovely little 8.5×11″ staple-bound paperback of 30 pages. While it’s a skinny book, the content is quite dense. There are 16 exercises – or “studies” – included in Arpeggio Meditations and all of them make some sort of musical point. The beauty of this diverse approach is that anybody can find something of interest in the pages. There are simple studies for beginners and some crazy pieces with odd chords in hard time signatures. Good stuff. Daniel begins the book with several pages of instruction: how to use the book, fingerpicking, and practice. This sets a nice tone and explains the author’s purpose of the book. From there the meditations begin and you don’t see any more text until the very end. Each study is presented in the standard notation/tab hybrid that is common for transcriptions these days. But Mr. Ward included some information that most books don’t: very specific fingerings for both hands. The picking patterns stay mostly the same throughout each piece. They are outlined on the first cycle via “PIMA” finger notation. More exciting is that the fingers used for fretting every chord and note are shown every time there is a new change. This leaves no question of what finger goes where and forces you to play the study exactly as Daniel intended every time. To aid your playing even more, chord diagrams show almost every tricky left hand movement. As you get further into the book, simple chords like C and F are presented without a diagram so as to to keep the learning productive. Speaking of chords, those that are included in Arpeggio Meditations For Ukulele are great! Many times we learn chords without context, and, while they might be cool, they don’t really stick. Daniel has utilized many interesting ‘ukulele grips in his book and all of them have purpose. Usually the purpose is to capture the vibe of the the title. Air Pudding, Ice Land, Nebula, and others sound like the pictures their titles conjure. A Bb(#11) played with the picking pattern in Istanbul Bridge sounds… well, Turkish! In addition to the book, Daniel has created 16 corresponding video lessons. These tutorials – one for each study – accompany the notated meditation pieces and provide step-by-step instruction for each. The Arpeggio Meditations videos are fabulously well done; it’s possible they are the most well-produced video lessons I’ve yet to see for ‘ukulele. You can rent the whole collection of 16 tutorials for $6.99 on Vimeo. The rental lasts for a whole year so it’s a total no-brainer. Because the book is so focused, there aren’t any detours for tips or suggestions, but in the videos Daniel takes time to address these things. The content becomes a much more rich because of this extra knowledge. It’s also a chance to witness his fingerpicking technique and really get down to copy-catting one of the best by visual means. For about the price of a 30-minute ‘ukulele lesson, you can get Arpeggio Meditations For Ukulele along with the videos. I imagine that this material, if you really studied it, would take months to work through and be very worth your while. You might not get it all in one pass. If you’re a beginner you might work on the first few and then get frustrated. But that’s the beauty of a book – you can come back to it in six months when you’re a better player and tackle the next handful of studies. You learn the most from things that challenge you. If you’re more into exercises, the book by itself might give you everything you want. But if you want some background on the techniques and other tips, be sure to rent the videos as well. This is definitely one of the most unique and thoughtful ‘ukulele books I’ve seen in a long time. I’m a big fan. 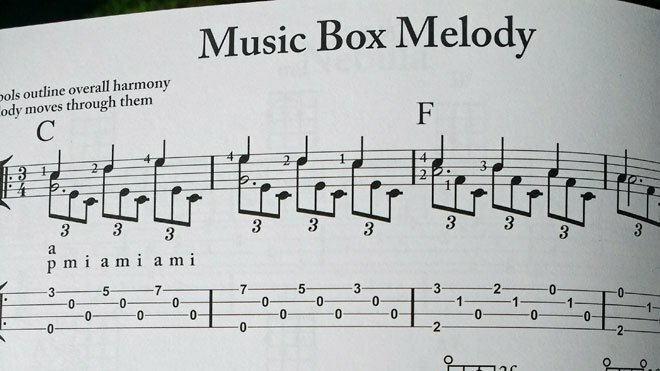 16 exceptionally-composed fingerpicking studies for ‘ukulele ranging from beginning to advanced levels. Supplemented by professional, beautiful video tutorials. Slightly short. Adding four more studies would make for a satisfying 20. No written explanation/tips for individual studies.